Jungle Red Writers: Luxury or Necessity? RHYS BOWEN: Luxury or Necessity? I had always dreamed of a Porsche but my logical side says why pay for a car that can do 130 m.p.h when I get a ticket for anything over 65? And it really is rather small for that long journey between San Francisco and Phoenix. I have always wanted a convertible but most people have stopped making them, apart from VW Beetles and companies like Mercedes for the price of a small house. And Lexus has exactly the same body as my Camry. And Mercedes gas mileage isn't great. And I don't like Audis very much-- so the question is what exactly does luxury mean for me? A good looking sleek exterior, but then my Camry looks pretty elegant. Heated seats would be nice for winter, but my winters are in Arizona where they are not necessary. I don't need wood trim. I don't like leather seats--too hot in summer. But I would like a moon roof. And a built in GPS system. And blind spot warning would be nice and something that flashes if I stray out of my lane. And a car that parks itself? That would be great. So I'm going to keep looking. I may well end up with another Camry! And this has started me thinking, dear Reds. What does the word LUXURY mean to you? Not just in cars but in life? For me it's not designer clothes or expensive wines. Oysters and lobster any time, definitely. Being pampered with a massage occasionally although I died of boredom when I had a facial. I find as I get older I am less attracted by things. Time to myself is a great luxury. And I have to confess that traveling business class really is fabulous and worthwhile. And being able to visit far off and exotic places. HALLIE EPHRON: A Camry IS luxury... said the woman who's driven a long line of Honda Civics into the ground. Reliability is what I care about in a car. Period. I'm sure this will come as a surprise to no one, when it comes to luxury for me it's all about food. The occasional really good steak. 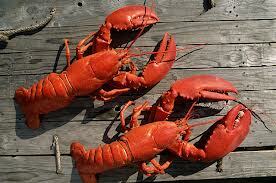 Lobster of course. Fresh fish right off the boat. Ripe garden tomatoes. Real saffron and fresh herbs. A really swell bottle of champagne to wash it down. ROSEMARY HARRIS: There have been trips when a flush toilet was a luxury for me. When I was young I thought the Jaguar, British Racing Green of course, was the coolest car. Now I just want something I can throw all my toys in. My car is a 12 yr old Jeep Grand Cherokee. Pushing 150,000 miles. Luxury is now mostly experiential. Less about the thing and more about the experience. Privacy is a huge luxury for me. I would rather have a tiny house on a plot of land with no neighbors than a MacMansion chock-a-block with the next guy. Not a jewelry person - I'm wearing a $6 ring from Urban Outfitters next to a Cartier. And I'm happy shopping at TJ Maxx. I don't really have Food Envy either. I have framed the menu from Paul Bocuse but no desire to go back. And nice hotels are fine but I've really taken the kool-aid on house or apartment rentals. I don't really like all that bowing and scraping. Lest I sound boringly high-minded or highly-evolved...last May we stayed at Villa San Michele in Fiesole. Their scraping was mighty fine. Luxury is the perfect thing at the perfect time. And just the way you want it. And I confess when we travel, when I can afford to I stay in nicer hotels. DEBORAH CROMBIE: My Honda Accord is five years old. I traded in my last Accord at five years, but think I'll be driving this one at least another couple. It has 40K on it, and is still great. It is an EX: leather seats (a must for me because of the dogs), seat warmers (which I ADORE), and a moon-roof. And I do like high-performance cars (I once had a Honda Prelude, which was fabulous,) but they just don't make any sense for my lifestyle. Other luxuries? I don't care anything about expensive jewelry, or fancy-label clothes. Nice restaurants are an occasional treat, but most of the time I think I could make better at home. My idea of a fun evening out is a couples' date with my daughter and her fiance at Mi Cocina's. (Mambo limos!) Or dinner and a movie at iPic. I like nice hotels and room service when I'm traveling on book tour, but am happy with a Hampton Inn or Hilton Garden--middle of the road and just fine. $10 a bottle Sauvignon Blanc is my wine of choice, although I dare say I'd enjoy better but it's not a priority. I'd like to travel more, but when, between book tours, trips to England for research, and deadlines! Most of our money that could be spent on "luxuries" goes into the old house! HANK PHILLIPPI RYAN: This is such an interesting question. It really is. What is luxury? Ah...I love to travel with extra legroom seating, love to get on the plane first and stash my carryon without battling for space.. i love to have a comfortable hotel room, and room service. (Part of it is--just wanting to have some time to myself. I love my profession, and the book tour--it's a dream! But sometimes, the luxury is quiet, and time. I'm not big on jewelry, and fancy food is nice but not something I think about. I love to go to Costco--but buy rack of lamb. Does that make sense? I love nice t.owels, and bathrobes, and great shoes, and perfume. I have a lot of clothes--but I've been on TV for35 years. And RO, to quote Sue Grafton, I don't do rustic. Our car! Oh, dear. it's a 12 year old Avalon, which we love which has, I think, 145,000 miles. We love it. I always look at BMWs on the road, but I don't need a BMW. I really don't care about cars. And, more than you ever needed to know, I have never had a massage or a facial. But I do use a Chanel compact and I insist it's the only one that works. LUCY BURDETTE: I love good food, but it needn't be fancy or expensive. I like to read about tasting menus costing hundreds of dollars, but more for the theater of it and the personality of the chefs than all that frou-frou food. Cars I don't care much about either. But like Debs, I'm crazy for seat-warmers--on days when your back hurts a little--heaven! And the times we've upgraded to business class with miles have been very very very pleasant. Seats and baggage space are so tight on planes these days--I find the whole business quite stressful and not at all civilized. Some years ago we were taking my elderly father and stepmother to England for a last hurrah. I worried ahead for months and months about getting us upgrades for the trip overnight to London. When we got to JFK (a horrible airport! ), I sent my wonderful hub up to the counter to check our status. He came back after a while and reported that we'd been offered the upgrades to business class but he turned them down. "They were going to charge us an extra $75!" RHYS: I'm amazed that so many Jungle Reds seem to drive 12 year old cars. I like to have a car within warranty when I drive those 800 desert miles between SF and Phoenix. So I think our combined confessions seem to indicate that luxury is not brand or style, it's comfort and good food and time. Amen to that. How about you dear readers? What is your idea of luxury? Luxury would be a fully outfitted wheelchair van, pre-adapted for my chair, that I could drive myself. It should have plenty of room for fresh lobster and clams. It should have advanced electronics, so I could use on my digital devices on the road. And it must come trained to stop only at very good hotels and restaurants—except that I should be able to override this feature when I want a drive-through burger. I love my four-year old Prius and plan to drive it for many years to come. I love staying in a hotel with really nice sheets and coming back during the day to find the bed all smooth and made up again, every day. And I've only flown first class once (free upgrade), but it was a dream, especially since I had a hefty three-year old son with me. He slept all the way from Mali to France, while I stretched out my short legs and savored the champagne. Luxury is snuggling under a warm quilt on a cold night . . . caffe mocha . . . sleeping late . . . spending time with family . . . . In my world, luxury is also getting wherever I need to go without having to drive myself there . . . I love my Saturn, but I really, really, really despise driving . . . . I love good clothes and shoes -- not necessarily designer or that expensive, but stuff that fits right, moves well, and looks somehow me. I also love lobster, sushi, steak, farmer's market veggies, rich soups in winter, smoked salmon, avocados, Bing cherries, arugula, pineapple. The food list goes on and on. But the best luxury is being on vacation in Block Island (we go every summer), waking up when we feel like it, and eating breakfast on the deck with a view of the ocean and lots of flitting birds. I so agree, Joan, on NOT having to drive. For me, luxury would simply be not having to get up on a Monday morning to go to the "real" job. Let me lounge in bed, read a book, post to the blog and watch a little tv and I'll be happy. That said, I also love to spend time with my family and friends. Oh, and I'm not giving up my Mini Cooper anytime soon. Reine, I love your response. Especially the notion of a van full of lobster and clams. Joan, I'm with you on being chauffeured being a luxury, at least when I am outside of Maine. I'm fine driving here, because the rules of the road mean something. We're just back from a weekend trip to Philly and let me tell you, 495 and the Mass Pike and 84 and the Jersey Turnpike are populated with lunatics! Luxury for me is eating fresh food, sleeping in, having a sweet swimming spot, and a day with little else to do but read. Vacation is coming up in two weeks, and I intend to indulge in all four every day. Brilliant! NOT HAVING TO DRIVE. And luxury is getting to ignore the clock, right? Especially in the morning. And having someone else make breakfast! Ahhh, luxury. Sure I'd love a red Ferrari but that's not going to happen. Last week I bought our third Honda Fit (So many Hondas here on JRW) and I really like it. I flew to Taiwan a few years courtesy of their Ministry of Foreign Affairs. It was first class all the way and I could really get used to that. But it ain't gonna happen. Right now, luxury to me is sitting down with a cup of tea, looking out over the mountains or ocean, and enjoying retirement. I'm thankful we're able to do that. I just got a brand new blue HONDA CRV that replaced the silver one. I love having my own car, having a dishwasher, having the washer & dryer & bedroom on the first floor. I don't need "luxury" hotels, but I like feeling as if I can stay in a hotel instead of at a friend's house when I visit (although I practically run a boarding house in the summer, I love the anonymity of hotels). 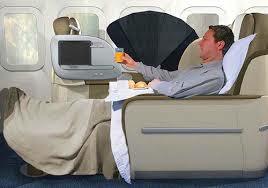 I have flown first class a couple of times, and it would be pure luxury to always go that way! Basically, I appreciate what I have. I'm struck by how many people say"time."Definitely. And the luxury of being able to hire people to do the things you find time sucking. Airlines: I traveled business class several times, courtesy of a former employer, business class. I must say, it is pretty wonderful! So wonderful that when we went to Greece a few years ago, I said to husband, "It's a long trip and our skeletons are not so flexible now. Let's dig into the ticket awards and upgrade." It was a great beginning to the vacation. Shizuka, I want your food. And your vacation... I'm with you on the clothes, too. I like things that fit well, move well, and look like me. I just don't care about labels. And for summer, writing at home, it's Target all the way. I like it that for most of us, the biggest luxury is more time to read. Denver airport, waiting for my fog-delayed flight, having turned in my Chevy rental car. That was not it, for sure. Drove okay, but not comfortable for long drives. Since when is an armrest a luxury? All suggestions welcome, if you have any. As a lifelong insomniac, really good sheets and other bedding is a must. I will gladly forgo dining out to afford 800-count or higher Egyptian cotton sheets, good pillows, and down comforters. I so agree about hiring people to do chores that take up time. I'd love a maid and a cook (if she could cook like Hallie). But I'd never, never spend $300 on a white T shirt I once saw in Bloomingdales. I'd never spend a hundred dollars on a bottle of wine. The $10 variety tastes fine to me. I guess luxury is something just out of reach or a big stretch for each of us. A while ago luxury was stopping at a coffee shop for a cup of coffee and a chance to read. When you can afford something any time you want it loses appeal. Although I grew up without much money, I've always pampered myself for what I really want. Right out of college I hired sometime to clean my apartment--a college student who needed the job. Cars? I've had BMW's and even a Porsche that I bought under odd circumstances, but that needed endless coddling. Now we have a 2-year old VOLT and love it. Best car ever. One car for my husband and me. I have lots of jewelry courtesy of my dear mother-in-law. Luxury for me? Flying business class for any flight over 4 hours! Luxury is working three miles away from home and no longer commuting into the worst traffic in CT twice a day! Believe me, I thank God for this every single day! Luxury would be staying in a hotel on vacation instead of sharing a house rental and needing to do our own meals. But I thank God that we have been able to do a vacation with the extended family for the last two years, instead of going three or four years without an away vacation. Luxury is doing as much reading as I can fit in during a regular week, and doing much more when on vacation. Recently, a friend was shocked to find out that I read a few books while on vacation; in her words" vacations are for having fun, NOT for reading". I told her that reading IS fun, and that's why I do it! Luxury would be having the money to hire a cleaning person, but you can't have everything; sigh. I always drive my cars into the ground, and do not replace them until my mechanic tells me "promise me you won't take this car out of town". My last two have been used cars and I expect that any future cars will be, too. My current car is a ten year old Honda Civic which I bought six years ago. There are a little over 70,000 miles on it and since I work only three miles from home (hurray!) I expect to have it for a long time. 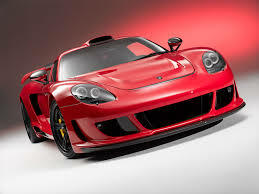 This is my favorite car of all time! I'm not a clothes horse...I just make sure what I'm wearing is clean and in better shape than my rags. Since I hate shopping, that's not always a "given"! Fun to read about all your wishes--and best of all, your gratitude! I thought of one more story about my father. When my stepmother died a few years back, we had to move him to an assisted living facility nearer to family. We assigned my brother the job of flying with him from NJ to FL, and decided they should go first class because of my father's frail condition. I called my brother to see how it was going. In the background, I heard the stewardess ask: "Would you like anything to drink, sir?" Dad piped up: "A bloody Mary." Which would have finished him off for the rest of the trip. But I laugh every time I think of him, settling right into that luxury. I can beat you all on the Civics. My first was a 1991. My current is 1996 (I've had it 9 years). So the luxury item on the list for this decade is a newer Civic, or maybe a Fit. Luxury is time and creative space. Like Kristopher, no day job, just writing fiction at a schedule that's good for me. Travel is the big one. I'm a wanderer at heart. 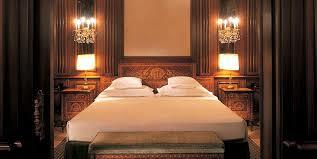 I would love to travel business all the time and stay at nice hotels. Also, the best doctors and health care. I'd love not to have to worry about that. In the meantime, is it luxury if it's become necessary? We no longer use regular bath towels. We use bath sheets exclusively, the thicker the better, and when we travel and I have to use a regulation hotel bath towel, well, I'm just glad to be home. I stay home with my kids who are three and four. Luxury is going to the bathroom by myself. Bliss is taking a book with me and hiding out for a few pages. You can have my Chevy Malibu (2007, 42k miles) when it falls apart on the road. I love it. Theater tickets! Yes. And concert tickets. And a person to deal with health insurance, Medicare, Social Security, bills -- I think I want a secretary, or maybe a wife. A house husband who LOVES the domestic arts; knows all about technology and fixing cars; enjoys graphic design so he could do my website, my as-yet-nonexistent newsletter/mailing list, etcetera; AND...and and and is the best beta reader ever! Luxury would be writing on my own schedule without worrying about a day job. And flying first class. I've done it often enough that I want to make it a constant thing. I'm meh about cars. I don't care what it looks like or the brand, I want a car that is reliable and doesn't make weird noises. Because when your car makes a mystery noises, it's a bad thing. My luxury is, I take short solo trips. A clean and safe hotel, preferably in the off season at the beach, a few days to do what I want to do and answer only to me. I try to do it twice a year, at least. ah, sweet luxuries. To me that means fresh flowers in my little house and not having to have curtains on my windows because there aren't any neighbors close enough to see in. The older I get the less I want/need. But I really do love the occasional facial. In the spirit of being grateful: There is no way to fully express my thankfulness for the $500 grant that Polio Epic of Tucson gave me for the most accessible iPhone ever. t can do everything. You would be shocked to know what it can do. It has enough memory to store all my books, music and films. A special program enables me to write on my book as I talk to it. It immediately stores what I've written into a word doc on my computer. First I have to tell you that as I read everyone's comments, I kept hearing Eliza Doolittle singing "All I want is a room somewhere, far away from the cold night air." But I digress. To me, luxury would be no day job for me or hubby, able to pay someone else to clean my house, unlimited travel budget, and the ability to help out my kids and my favorite charities. My Honda Accord has 174,000 miles on it, so clearly I haven't made new cars a priority. I think a nice little Mini Cooper or VW Jetta Hybrid to replace it would be pretty luxurious! I'm sitting here with the news on, watching a story about child hunger and food insecurity. This weekend I bought three pounds of beautiful, snow white, new potatoes and I realize for too many people those are a luxury. I am in a similar boat as Paula. Stay at home mom to a 2 and 4yr old. For me, luxury would be a full-time, live-in nanny and a big 5-br 4ba house with a fenced in back yard so the kids could roam freely. A new minivan with the works would also be nice. And able to fly biz class when we go to Australia to visit the in-laws, and able to travel to Europe, etc. I also like to stay in nice hotels--they don't have to be 5-stars, but at least 3-4 stars. Just having the luxury of being able to afford a nice night out at the theater and dinner and pay a babysitter would be nice. It's been soooo long since anything like that has happened. You all are so lovely and thoughtful.. I am so proud and delighted to know you.. When I flew British Airways (the only airline I fly to London) in 2010 from DFW to LHR, I planned my aisle seat both ways in the small section of World Traveller Plus which is a private upgraded economy. I was pleased about this as I've flown in that section several times. Just before boarding, my name was called to come to the counter where the lady asked for my ticket and handed me another ticket and said "You've been upgraded to Business class."